This is the story of how Hurricane Katrina ten years ago affected my professional life, as I remember it. I totally understand if you have no interest and want to skip this post. You have my permission to stop reading right now. I need to actually start in 2003. In spring of that year, I made the decision to leave the elementary school where I had been librarian for twelve years. It was an extremely hard choice to make. I loved the students and parents at that school. I believe that I was made to sing, dance, use puppets, and voices to bring books to life for the younger set. I had developed a program where I taught information literacy and library skills in a very systematic way to the students. I loved what I was doing and was extremely proud of my program, One of my good friends worked in a school of 1500 students in grades 7th -12th. The other librarian, who was also a friend, was retiring. If I did not move at this time, I might not ever have a chance to work with Jo Ann again. My friend Jo Ann had been at McMain for about nineteen years, and she had helped to develop a wonderful teaching library at that school. I was shaking in my boots to work with that age group, but I knew that it was a good move for me. It would give me a chance to learn and grow. When I arrived in August of 2003, I found the most awesome group of teachers, many today are still friends, and a group of kids who loved the library. We had the best time working together, and we also had a full time clerk who had been there over ten years. That library was a well oiled machine, and I could help move it forward into the digital age as technology was one of my strong suits. In May of 2005, we were hit with a time bomb. 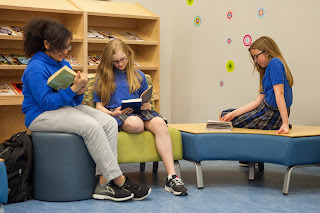 The new principal informed us that the Orleans Parish School Board had decided that all the schools in the district could manage with only one librarian. The school board did not care about the size of the student body. That meant that I was out because Jo Ann was the senior librarian. Let me tell you, that library and the program there was amazing. However, the library was designed like a bowling alley, and there was no way possible that one person could teach, serve 1500 kids, and manage it all by themselves. I wanted to be pro-active, so I found a very small elementary school close to home that was without a librarian. I asked for that position and got it. When school started in August of 2005, I was working at Bauduit Elementary. Then on Friday, August 26, 2005, I found out that the school board was going to change their position on only one librarian. All the schools with over 1000 students would get their second librarian. I was thrilled. At the end of the day on the 26th, we were told to leave the computers on in the school because IT would be working on them over the weekend. At that point, no one was thinking that Katrina would be heading our way. Saturday morning I woke up early and went to the bookstore where I was scheduled to hold a story time. There were only a couple of kids there with their parents. Everyone was talking about the hurricane named Katrina in the Gulf of Mexico, but most were up in the air about the need to evacuate. My husband and I were going to wait until the afternoon when I returned home to make our final decision. He was going to go to the grocery to stock up on food while I told stories. Early Sunday morning we did evacuate to New Iberia, LA. It was in New Iberia that I became the resident story teller for Sugar Cane Academy, the school created by Paul Reynaud. He had evacuated to the same house as us. One of the parents wrote a book about that experience of starting a school from scratch. You can see the cover of the book in the picture above. Being a part of Sugar Cane Academy brought me back to elementary school, and it kept my mind busy so I worried less about the future. At some point in August or September, all the teachers in Orleans Parish were dismissed from their jobs. I had no clue what I was going to do next. I had a house in uptown New Orleans that did not flood and had very little damage. I had a home where I could return but no way to make a living. 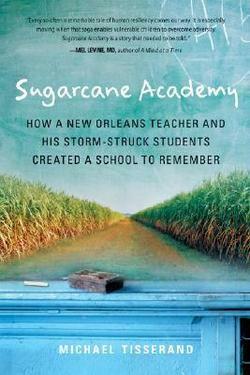 For a few months I worked part time at Sugar Cane Academy when it moved to digs at Loyola University in New Orleans. After losing their teaching jobs, many of my friends with twenty or more years in the system decided to retire, including my friend Jo Ann who worked at McMain. In November, I got a call from Orleans Parish Schools. McMain was going to open in January of 2006, and I was asked if I would be the librarian. I needed a job, so I said yes, Many of the teachers returned but not all. The school opened in January with about half of the original population and students who had attended almost every other high school in the district. I could manage the library with 800 kids in the building, but there was a new administration hired to run the school. This was the fourth principal since I started at McMain in 2003. This principal and her assistants were not familiar with a busy library where the librarians served as teachers. I realized early on that I needed to find somewhere else to work that would allow me to be the professional librarian that I knew I could be. In April of 2006, Jefferson Parish schools was expanding the number of advanced academies in the district. There were several librarian openings. 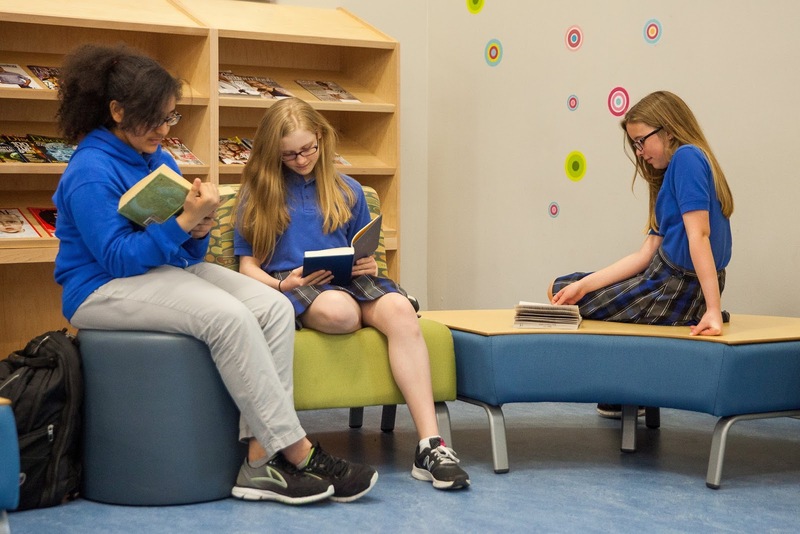 I felt confident that I could run a library serving middle and high students on my own. I had learned a lot in the three years that I had been at McMain. I interviewed and within a day or two I got the phone call offering me the job at Patrick Taylor Academy in Jefferson. I just began my tenth year at Patrick Taylor three weeks ago. I have watched it grow from 178 students serving grades 7th-10th to its present 550 students in grades 6th-12th. The school is now located in a brand new building in Avondale, LA which is thirty minutes from my home. I feel like this school is my second home. I am definitely one of the old guard there, and I have worked with every single student who has graduated from Taylor. Yes, my life has truly changed because of Katrina. In some ways, my life has taken a turn for the better that would never have happened otherwise. Thank you goes to Kristy Philippi, the principal of Taylor who hired me, and also to the current principal, Jaime Zapico,who has the confidence in me to support all the library programming ideas that I believe the school and the students need. Thanks for sharing your story. I can only imagine how difficult the uncertainty and changes were to go through. Sounds like you ended up in the best place for you! It's amazing that you have been able to find so many jobs. How nerve wracking! At least you have been able to hang in there! Glad to hear that things are finally going well. I have always landed on my feet, but it is especially nice to work in a place that I love so much. The kids here are awesome and so are the teachers. Thank you so much for sharing this story. I didn't realize so many teachers and librarians just lost their jobs. You make me wish I could come visit your awesome library when I visit New Orleans at the end of September. You are welcome to come visit my library. We are off the beaten path, but we love having visitors. I wish I had been able to stop by! My visit to New Orleans was wonderful! I loved it so much I planned another trip already when there is a book convention at the end of September this year! One other question! I'm wanting to do a display on Mardi Gras in my library this month, to lead up to the actual week of the parade, and am wondering if you know of any fiction books that would be good to put as part of the display. I know that Paula Morris's books are set in New Orleans. And probably several Anne Rice books. But do you know of any teen books that are more popular that maybe actually have Mardi Gras taking place in them? Thanks! There are a couple of picture books out there with Mardi Gras as part of the story. I don't know of any middle grade or YA books with Mardi Gras as an integral part of the story. Lisa Maxwell's books Sweet Unrest and Gathering Deep both set a mood that is evocative of New Orleans. I can't remember if there is a Mardi Gras scene. There are definitely scenes in the French Quarter. This is Mary from DialMyCalls. We're a service teachers use to send phone calls & text messages to all the parents of their students. I came across your blog and wanted to reach out. I'd love to invite you to try out the system completely free and get your feedback on it. I made the coupon code, TEACH1002015. If you sign up and use that coupon code, you get 100 free phone calls and text messages added to your account to try it out and see how it works. We have thousands of schools and teachers who use our service every year. It's a really powerful tool and a great time saver for teachers and schools. Feel free to post the coupon code on your site if you'd like. I set it to expire at the end of this month. Please let me know if you have any questions or comments, we'd love to get your feedback on it.